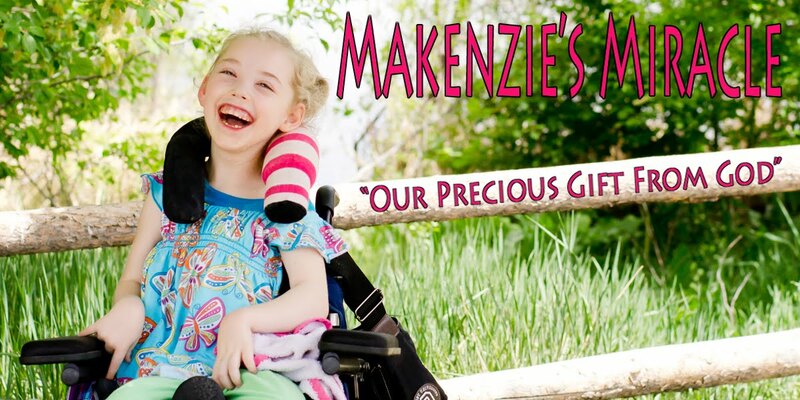 What the number police didn't account for when it came to Makenzie is that her God is more powerful then numbers. Her mom was there to advocate against their numbers, and Makenzie would fight with all her might to prove the numbers wrong! I can say sometimes in the first couple of years these numbers got me down. As each one of the number markers came and went I would look at Makenzie and wonder if they were right. I would wish that the number police would have just keep their ugly numbers to themselves. I would hope and then I would put my boxing gloves back on and dig my heals back into the ground and keep pushing my girl a bit harder. Dancing to loud music while smiling and laughing. Makenzie is more vocal every day. She cries when I walk out the door. She pouts when she wants something. She smiles for yes. She doesn't like to be cold. She talks with a talker. She moves her arms to play with toys and give hugs. She understands everything and can follow directions. She is learning her numbers, letters, colors, and shapes. She loves school. Lately I have been noticing another huge thing with Makenzie. It started when Mr. 11 was in the hospital. We had a long appointment to get her wheelchair adjusted. My mom came to stay with Mr 11 and we headed to our appointment. Makenzie had breakfast before we left but was unable to have lunch due to not having a chair to sit in as well as being taken in and out of the chair in between adjustments. On the way back to the hospital I stopped to get a burger. Makenzie started squealing in the back seat so I parked and let her lick a fry and then started to drive away. Makenzie started to bawl complete with huge alligator tears. I re parked and asked her if she was hungry. She stopped crying and I gave her some more licks of burger and fries and assured her that as soon as we got back I would feed her. Up until that moment Makenzie has NEVER expressed hunger. I questioned for several days if that was really what happened. This week she has showed me over and over again that it is and not only that but she has also made it very clear that she want to eat with her mouth. Eating purees through her mouth is something Makenzie has done for a long time on and off however a forgetful, exhausted mommy moment pushed eating to a new level for Makenzie when we went swimming and I forgot her food. There were some raviolis in my friend's cupboard so I smashed them up into tiny pieces and crossed my fingers in hopes that Makenzie would tolerate the texture and we wouldn't have to leave in order to feed her. Much to my surprise she LOVED it so much she ate two bowlfuls. Since then Makenzie has eaten Mac and Cheese with mashed potatoes at Applebee's (which she cried about because I wasn't getting them ready fast enough). She has had spaghettii o's and mashed potatoes, and tonight for dinner she had mac and cheese with chicken, baked beans, and peaches. She loves it and I am so stinking proud!!! I am pretty sure the number police are down for the count! I love to watch Makenzie grow and prove the odds wrong. I love to watch her learn new things and become such an amazing little girl. I am so blessed to call her mine! Over the last couple week since Mr 11's hospitalization for a blood clot, frustration and exhaustion has been high. There are just not enough hours in the day. I have two kids that need an immense amount of my time and two that have sat on the back burner. There has been way to much time spent in the car and video games played. My house has been neglected and fun times have been scares. Friday afternoon I was done. I was tired and I had been pushed to the breaking point. What people don't understand about my breaking point however is that it has nothing to do with throwing in the towel rather it involves a mama bear fighting with even more intensity to gain back control of the things that have gotten out of hand. It involves irritation and lack of patience for though who get in my way. It can be ugly in a very professional kind of way. It does not included cursing or yelling but finding ways to play the game with more strategy and learn more tricks of the trade. So needless to say this morning once again we drove down to the doctor's office. They poked Mr 11's finger and 90 seconds later we learned that FINALLY his blood held enough blood thinner to be considered therapeutic. YEAH!!! I talked with the nurse a bit about my frustrations and she told me that they had called around to some labs for further blood draws with no luck. Then she told me that the social worker wanted to chat and I just chuckled. The woman was nice. She was very kind and seemed very willing to help. However, as I expected before she even walked into the room she had nothing to offer. She had no other ideas. She empathized and basically told me that if I ever wanted to call and just vent I could. Not helpful. It was very kind of her to try. However, one of my many calls to home health care companies paid off this afternoon. I found a company willing to admit Mr 11 and will come to my house with a PT/INR machine whenever necessary to poke his finger, chart the number, and call the doctor. SCORE!!!!! I am sure it won't eliminate all appointments but it will decrease them a ton!!! To back up a bit I do want to say that I am in love with all of Mr 11's doctors. None of this is their fault. The testing they do is necessary and I am grateful to have such a thorough group keeping my son healthy!!! Our pediatrician has stepped up to advocate for Mr 11 as well and for that I am eternally grateful!! Irregardless something had to give and my one wish is that doctors and nurses had a better understanding of how the system in which they practice operates. There was an easy answer to this problem but I had to do all the leg work and shoulder frustration that could have been avoided if someone knew all of the options already! This week I also found time to organize a bit so that I could get rid of some clutter. Makenzie's therapy room got a complete overhaul. I have not decided on paint colors or curtains yet but I am so excited to have all of her stuff in one place! Saturday I did 10 loads of laundry that had been neglected for the last two weeks. I have never been so excited to have all of my laundry washed, dried, folded, and put away as I was that day!!!! In the midst of my laundry I got several other things done around the house as well and am feeling a bit more caught up in that department. Sunday we had a relaxing day and in the evening I was able to get my grocery shopping done! I planned 7 meals and am relived that is done because fast food was beginning to make me sick! Today we had speech therapy, ran to the doctors, and started the processes with the company that will be doing Mr 1's PT/INR management. This afternoon we headed to the pool for a great time together. I forgot Makenzie's g'tube food so I smashed up some raviolis and Makenzie ate 2 full bowls! I was not sure how it was going to go because I have never given he anything with that much texture but she handled it like a rock star! Makes me wonder what else she can eat?!!!!! Tomorrow I have an all day meeting for work. Yeah me! So lots has been going on but I think I have gotten most of it under control! I am looking forward to spending some time with my niece and nephew this weekend and maybe also having a bit of down time!!! I think I am pretty good at dealing with hard stuff. In the last 5 years I have rolled with a lot of punches. I have fought my way through much adversity and I have been an outstanding advocate for my children. Yes, there have been days when I just wanted to give up. There have been days when I wanted the world to come join my pity party and times when I have curled up into a ball and just cried for no other reason then it made me feel better. However some how I always manage to pick myself back up again and move forward. When we found Mr 11's blot clot that was hard but I managed to pack up a whole van full of stuff and we moved into the hospital for 5 days. When I found out that I was going to have to give him medication in the form of a shot two times a day until the oral blood thinner was at a therapeutic level, that was hard. We have gone back to the doctors office two times this week for blood work only to find out that his medication levels are moving in the wrong direction and the shots have to continue..... hard. Sometimes life is hard but all of this could be made easier with one simple piece of medical equipment. You see, in order to get Mr11 off of the shots that hurt, burn, and cause my son to squeal like a girl, his oral medication must be at a certain level. In order to find out what that level is, we have to drive one hour to the the doctor. While we are there for all of 10 minutes they prick his finger and squeeze his blood onto a strip and put it into a machine that very much resembles a diabetes blood tester. Within two minute the little device spits out a number and we are done. Then we drive home back through downtown traffic and three hours after we left the house we are done. Hard. The point in this situation that has got me all tied in knots is that there is a little thing called an INR machine that we could have at home to test the same thing. In 2 minutes we could be done. No driving. No missed therapy. No extra gas. Easy. However, it has been determined in a very black and white way that you can not access this machine until you have been on this oral blood thinner for at least 3 months and even then I have been told that most insurance companies will not even cover the machine. The thought of rescheduling our lives up to two days a week for the next 3 months for a two minute blood test which could be done at home is about to push me over the edge. It could be easier but yet on Monday morning we will once again go from therapy to the car for an hour plus drive to the doctors office and back again to do what I could do in two minutes at home. None of this bothers me because it is what my child needs. What does bother me simple fact that I know it doesn't have to be this hard. We could be spending that three hours swimming, going to the movies, hanging out with friends, or even just getting stuff done at home. I can access and care for a PICC line and IV antibiotics for 52 days with out issue and I can give my kid a shot of blood thinners twice a day but I am not allowed poke my kids finger and squeeze the blood into a machine for three months because some clinical directer at some company said so. So tonight I sit in my frustration. I found a home health care company that has INR machines but they do not typically do pediatrics. I am waiting to see if there is a way that they will take my son's case anyways considering what he needs consists of about four minutes per week. Please say a prayer that this alternative will work out. I have two kids that need therapy/medical attention. I can not and will not choose between them but I am only one person and there are only so many hours in the day. If we can get this blood work done at home or much closer to home everybody wins. Please pray. How can sitting in a hospital doing NOTHING for 5 days be so exhausting? The day after I wrote the last post about summer being in full swing Mr 11, Makenzie, and I headed to the doctor to check out some soreness he was having on his arm where his PICC line was remove a week prior. I had contacted two doctors the day before and neither thought it sounded like a big deal but Wednesday morning when we got up I felt like he needed to be seen. The doctor took a look and didn't seem overly concerned either and said she would be comfortable just watching it for a few days. 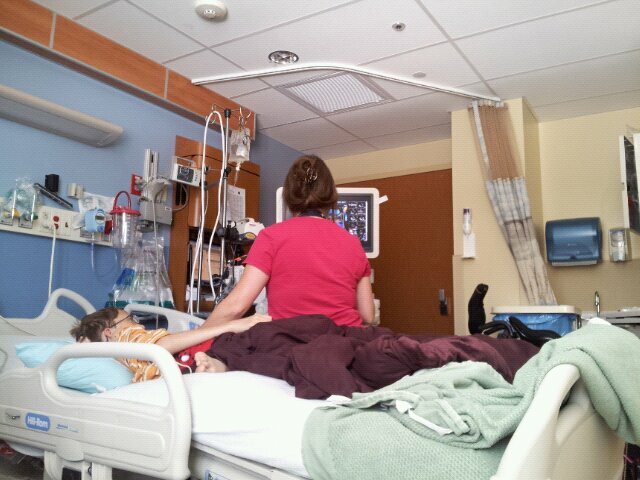 However, knowing how complete I like to be she offered to send us down the hall for a quick ultrasound just to be sure. Of course I took her up on the offer so 30 minutes and a fire alarm later we were standing back in her office waiting for a direct admit to the floor for treatment on a pretty impressive blood clot. When the doctor on the floor started talking about calling the cardiologist in to perform an ECHO complete with a bubble test to check his heart and make sure there was not a hole between his valves big enough to let a clot travel through and into his brain I think my heart stopped for a brief moment. When the phrase "potential stroke" fell out of her mouth I am pretty sure I could have curled up in a ball under the bed. However that is where the above statement comes in...... God is good! We got home early this evening. The clot is still there but stable and Mr 11 is on a cocktail of blood thinners to help it go away. There is a microscopic hole between his valves but nothing that would allow a clot to pass through which is great news. We are still watching for shortness of breath and chest pains which is still a bit unnerving. Please say a pray for Mr 11. Pray that this clot stays right where it is until it goes away. Please also say a prayer of thanksgiving that we caught it and that even though we did many physical things over the last couple of weeks it did not cause him harm! God is SO good! Sitting in the hospital is exhausting. I have no clue why because I got more sleep in the last four nights then I have in a long time. Sitting in the hospital is also really boring and tends to cause your mind to wander into deep thought more then usual as well. For the last 5 days I thought about the last fourteen years of my life. The years which I have been a mom. I thought a lot about the way we parent our kids and how sometimes we loose out on the joy of life trying to protect them from harm. You see I have learned in the past 5 years that it is not the things that we think our kids need to be protected from that harm our kids most of the time. I have watched many parents hoover over their toddlers (the helicopter mom) watching every single move, saving them from every scraped knee, bruised elbow, or bump on the head. I find myself shaking my head with a smile because I know that no amount of baby proofing, hand holding, or always being one step behind their bundle of joy will ever be enough to save them from what could be lurking around the bend. Now I am not against doing all that we can do to keep our kids safe but I stood there once myself. I had gates, outlet covers, special locks on the cabinets, medicine and cleaners stored in a high place, all small things out of reach, and water never sat in the tub or yard. However, no matter what I did to protect my kids at any age nor how much I worried about them could or would save Makenzie or Mr 11 from harm. Makenzie did not choke on a marble laying on the floor because there were non. I had made sure of that over and over again. She choked on a mostly chewed up piece of food. Unless, I never fed her...which wasn't an option....I could not have protected her from what happened on March 25th 2007. Mr 11 did not eat spoiled food or get hit by a car while riding his bike in the street to cause the damage in his gut. His appendix ruptured and unless I had gone to a surgeon when he was little and asked them to take it out because I did want to risk him ever having appendicitis, there was nothing I could have done to "protect" him from this. I am also guessing that the two wonderful families I met this week would have done anything to protect their babies from getting cancer at 2 and 14 years old but again there was nothing they could have done to see that coming either. My point is......We need to Worry LESS and Live MORE. Trust in the one who can truly protect and guide you through the hard times in your life. Also while you are lifting up prayer and thanksgiving for Mr 11 please also say a prayer for our new friend Big A and his family during his scary and painful 2nd bone marrow transplant! Praise God for this amazing young man's strength and courage and pray for complete healing and restoration to his body!!! School Is Out.....It Is Time For Some Summer Fun!! Summer is here and we have started it out with a bang! We have completed three graduations... one from Kindergarten, one from 5th grade, and one from 8th grade. We have had Hockey games, practices and a party. We have been swimming and to the skating rink. We have had a birthday party in the back yard complete with the slip and slide, and trampoline wrestling, and been to the amusement park. Then there is Makenzie's therapy and my son's very first all night lock in. Lets not forget two picnics at the park complete with water balloons, sand holes, face painting, bubbles, hamburgers, and lemonade and last but not least, summer would not be complete without a trip to get ice cream. I am so blessed!!!!! We started last week off with a visit from our good friend Stephanie. Oh how Makenzie and I miss her as a therapist but it is so much fun to see her when she is in town just to hang out and have some fun! The boys played some baseball while Makenzie chased everyone around in her power chair. The day before school got out the special education class took a trip to the park for some summer fun. They grilled, played on the playground, had a water balloon fight, and blew bubbles. The last day of school brought two graduation programs. Makenzie did a great job performing with her friends. Even though Makenzie will be repeating Kindergarten again next year the thought of my baby being a first grader is so amazing! I can't believe we have come so far and how big all of my kids are getting! Mr 11 will be going to Middle School next year and Mr14 will be headed to High School! I did not get any end of the year pictures of Mr. 14 because the very uncool parents were not invited to their 8th grade BBQ! Last week Morgan turned two and on Saturday we had a Birthday party in our back yard to celebrate. Oh how I love this little boy and am so blessed to have him and his family in my life! Sunday morning we got up bright and early for hockey practice and then headed to the amusement park for a day of amazing fun!!!! Miss Emily thought that the water guns were the best part! I drug Mr. 11 kicking and screaming into line for a roller coaster this year. Every year he says he is going to try a roller coaster and then he chickens out. So this year I pretty much forced him on the ride. I told him that he had to try at least one and if he still didn't like it then I would not make him go on any more. We literally started the ride with tears falling down his cheek but when the ride was over he was all smiles and got back in line to ride it again. The boys much have gone on all of the roller coasters at least 3 times each. I am so thankful for the accommodations that our park gives us on Makenzie's behalf! I do not think we waited in line for more then 5 minutes all day which makes the day go a lot more smoothly for Makenzie! Monday morning we headed out to the park to BBQ with a company who provides services to individuals with special needs. The food was great! They had face painting, balloon animals, massages, and gold old fashioned sand! After the picnic we went to the pool to cool off. Makenzie loves the pool so much! A day with a picnic and swimming would not be complete without a trip to get some ice cream. Makenzie waited so patiently for her ice cream. I ordered her a hot fudge Sunday and she inhaled it! I am so proud of how well she has been eating. She really does enjoy food and begs for it anytime she is around someone who is eating! Life is busy but so, so, so, good!!! With all four of my children we have practiced the family bed. Each and every one of my kids slept with mommy until they were about three years old. I loved sleeping with my kids. I loved the extra security it gave them and I loved the special bond it helped form when they were newborns. At one point we had a queen size bed with a twin next to it so that we all had enough room and I used to get the...... "are ya going to sleep with them forever?" comments a lot. I was told that transitioning the kids into their own beds would be harder the longer they slept with us. I was given more advise on this subject when my kids where younger then any other parenting topic you could think up. I didn't care. Each one of my boys to graduated into their own "big boy bed" around three. I am happy to report to all who where concerned that as teenagers my children no longer sleep with me...... thank goodness! I would also like to add that never once..... ever..... in raising 4 VERY different kids...... have I had one sleeping issue. I put them in their own bed and there they stay. I tuck my kids in at 8:30pm and other then times when they are sick they stay there all night. So much for the hard transition theory. At the time of Makenzie's accident she was still sharing my bed. We had tried a couple of times to put her to bed in her own bed but quickly let her re enter the family bed after I woke up to her little nose on my cheek in the middle of the night several time while her sweet little voice called my name and asked me to lift her into the bed. She has slept with me ever since. 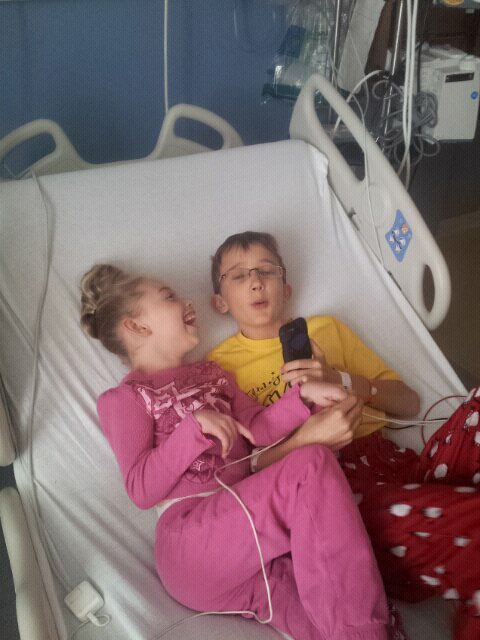 In the hospital, the night they moved us out of the ICU and onto the floor Makenzie began to neuro storm pretty bad. That was the night she began to cry incessantly unless she was sleeping. (this crying went on for almost a year) That night specific night was LONG. I knew my little girl needed our "family bed" so I crawled up into the metal hospital crib and curled up next to my girl and we slept. Needless to say the next morning they brought up a bed and took the crib away! Well today Makenzie got a new bed. It is called a Sleep Safe bed. There are no rails to get stuck in. There is no way to fall out. The mattress height goes up and down which will allow me to have her at my height to get her dressed and change her diapers. The head and the foot of the bed adjust up and down which will be great when she has a cold and another plus is that it does not look like a hospital bed! I don't like to visit that place and have worked very hard to keep my house from looking like that place. I went to the store and picked up a new pair of twin sheets and put her comforter on while she was as school this afternoon. When she got home the boys were excited to give her a "ride" in her new electric bed. I am not sure who was more excited... Makenzie..... or...... her brothers. There were also talks of making a fort. Then the big question was spoken out loud...... "Is she going to sleep in her new bed tonight?" That was a good one because I really didn't know. Yep she fell asleep with no problems!!!! I am so dang proud of my girl!!!! So I am now going to go crawl in my bed..... ALONE. I am going to toss and turn until I get comfortable and fall asleep. I hope I wake up in the morning at the foot of the bed because for the first time in over 14 years I do not have to worry subconsciously about waking anyone else in my bed up!!!!! !